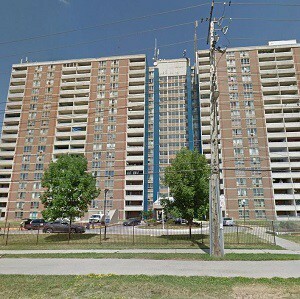 Minto Capital Management’s busy spring continued today with the announcement it has purchased an 18-storey highrise at 2777 Kipling Ave., in Toronto. It’s the sixth acquisition for Fund II., which was launched in January 2015 with capital commitments of $158 million. Fund II has a targeted annual return of 14 to 17 per cent, Minto says. Kipling will undergo a renewal initiative that includes in-suite renovation, interior common area refurbishment, amenity space improvements and security upgrades. “With this purchase, Fund II is now 80 per cent invested in property renewal initiatives across Canada, with a successor fund offering being planned,” said Glen MacMullin, the senior vice-president of investment management with Minto Capital. In the past three months, Minto has purchased Radisson Place in Calgary (see list below) and sold 50 per cent of its ownership of the Minto Place in Ottawa to Investors Real Property Fund. * Radisson Place which closed on March 20, 2017 is a 12-storey, 130-units multi-residential building east of downtown Calgary, complete with 11,400 square feet of commercial space. “As with Radisson Place in Calgary and St. Dennis in Toronto, (the 2777 Kipling Ave., transaction) is a further opportunity for Minto Capital to reposition a substantial multi-residential asset through our fully integrated platform” MacMullin said. Minto Capital Management Inc., is the investment management division of The Minto Group, a fully integrated real estate enterprise established in 1955 with expertise in asset management, property management, development and construction. With 1,200 employees across Canada and Florida, Minto has built more than 85,000 homes and currently manages 15,000 multi-residential units and 2.7 million square feet of commercial space. Minto Capital’s $2.9-billion portfolio is comprised of proprietary capital as well as private equity funds and joint ventures with institutional partners.